You could purchase your playset from a big-box retailer, but there's something extra special about the hometown experience. Here's what you'll receive from a local, hometown supplier that big-box retailers often can't deliver. Custom design assistance —At Idaho Outdoor Solutions, we offer a variety of playset configurations with our popular Backyard Adventures Playsets. When you work with one of our playset designers, you can proceed with confidence knowing that the customized playset you choose is just right for your family. Professional installation —At Idaho Outdoor Solutions, we offer safe, professional playset installation. Local support —There's something about local support that transcends anything a larger retailer can provide. At Idaho Outdoor Solutions, we love the local community and the people who live here. Our goal is to make sure you're happy with your purchase for years to come! Your backyard playground won't be much fun if someone gets hurt. 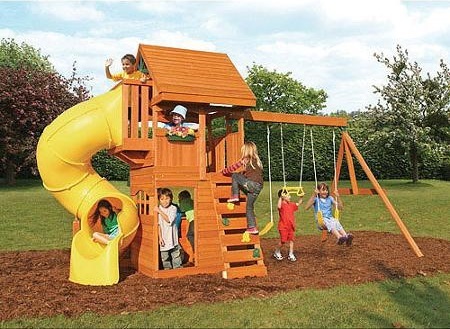 All of our 100% cedar Backyard Adventure Playsets are constructed and installed with safety in mind. Compression clamps are twice as strong as traditional non-clamped joints. As your children grow, it's easy to add stronger clamps to accommodate their weight safely. Swing beams are reinforced with steal strips. All swings hang by heavy-ductile hangers and thick-gauge chains to keep your little ones safe. Flat-step ladders prevent little feet from slipping. At Idaho Outdoor Solutions, we can help you make your backyard playground safe, fun, and affordable. Watch a Backyard Adventures video and get in touch with one of our playset designers to find out more!